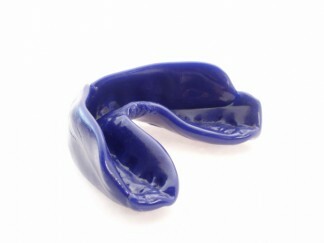 Mouth guards are an important investment to protect your teeth while playing sports. Store the model in a safe place and it can be used to make a replacement mouthguard at a lower cost – but only if it is in perfect condition. Rinse your mouth and the mouthguard in cold water before and after use. There is a danger of sports people getting dehydration and this affects their performance. And the reduced saliva flow resulting from dehydration can damage teeth, especially in the presence of acid drinks including sports drinks. To avoid damage and to enhance performance, have a good drink of water one hour before and immediately before strenuous sport. Rehydrate with more water at half time too. If having sports drinks, have a glass of water prior to doing so. And avoid high caffeine intake as this further reduces saliva flow such as in coffee, sports drinks and energy food bars. Avoid brushing your teeth immediately after acid food and drink as the enamel is softened by the acid and will wear far more easily. Delay your brushing and drink more water.